150+ filters: add a touch of magic with special visual effects. 100+ transitions: insert thematic fades between your photos. 40+ title styles: create an intro with the happy couple’s names. 20+ music tracks: set the vibe with one of the built-in music tracks. With Movavi Slideshow Maker for Windows or Mac, you can turn your wedding photo album into a memorable slideshow with appropriate music and special effects – no experience needed! Preserve your wedding day memories for all time. In this article, you'll learn how to create a wedding presentation step by step in just a few minutes. Run the downloaded installation file and follow the instructions to install the software. The software offers two options for creating your slideshow. 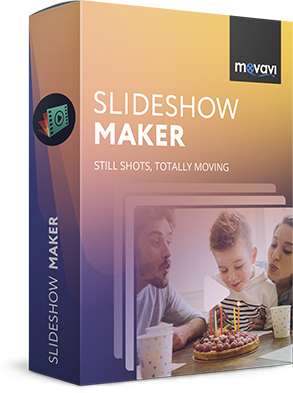 The first is the Slideshow Wizard mode, which creates an enchanting movie from your lovely photos in just minutes with the help of automatic transitions and ready-made themes. The other option is Creating a movie in manual mode, which lets you control every detail in the slideshow creation process (but it’s still easy to do!). Choose the manual mode if you want to use special filters and cool effects, add cute and funny stickers to your photography, and the like. You’ll find instructions for using both modes below. Both also provide on-screen tips to help you bring your wedding slideshow ideas to life. Upload your media files by clicking +Files or +Folders on the Files tab, no matter how many pictures you have and how long your videos are. After uploading your photos to the working area, you can easily drag and drop them into the appropriate order. Since we’re talking about a wedding, you can choose the special pre-made wedding slideshow template, and create a professional-looking slideshow. There’s also a wide range of other varied themes and backgrounds you can choose from. Each theme has its own unique set of effects, filters, titles, and music – so you can create your slideshow really quickly. After choosing a theme, click Next, and go to Step 3.4 below. If you want to choose your audio track, titles, and fades manually, select No Theme, click Next, and move on to the next step. Spice up your wedding reception movie with music. You can drag and drop your music files into the working area, or click +Music in the Music tab to choose and import them. Add a song that has special meaning for the couple or choose from a music library with a wide range of ready-to-use music tracks. You can set the transition style for your photos by opening the Transitions tab. Click No transitions if you don’t want to use transitions at all. At this point, you can make your final edits in Slideshow Wizard mode. Type your own unique text, like quotes and personal wishes, for your opening and closing titles by clicking the Preview tab, choose from a variety of caption styles. You can also adjust the length of your slideshow to the length of the soundtrack and remove any black sidebars from photos and videos. Preview your wedding slideshow by clicking the Play button. Hooray, your memorable wedding photo movie is almost ready! To save it, open the Export tab, click Save the video, and go to Step 4. Choose your photos and videos and add them to the timeline all at once by clicking Add Media Files button, no matter how many pictures you have and how long your videos are. Make your movie flow smoothly – go to the Transitions tab, choose from thematic categories, and select the transitions you like the best. Make your movie even more engaging by adding music and titles. Click the Add Media Files button to import your music or other sounds, or click Music to use soundtracks from the program media library. Open the Titles tab to browse the available caption styles. Choose the styles you like, and drag and drop them onto the Timeline. Double-click the titles on the timeline to edit them. You can write your own unique text, like quotes and personal wishes, and specify parameters like font, size, and color in the Preview Area. To save the changes, click Apply. Your photo movie is almost ready. Click Export and go to Step 4 to save your slideshow. You can select the appropriate option from the tabs on the left of the export window. Choose Save Video File or, for example, Save for Devices to watch on your computer or mobile device, or upload to YouTube by clicking the Upload to YouTube tab. When you’re done, click Start. Now you know how to use our handy photo-to-video creator with music, titles, and transitions!